Fill in the green box if you are individually applying for credit. 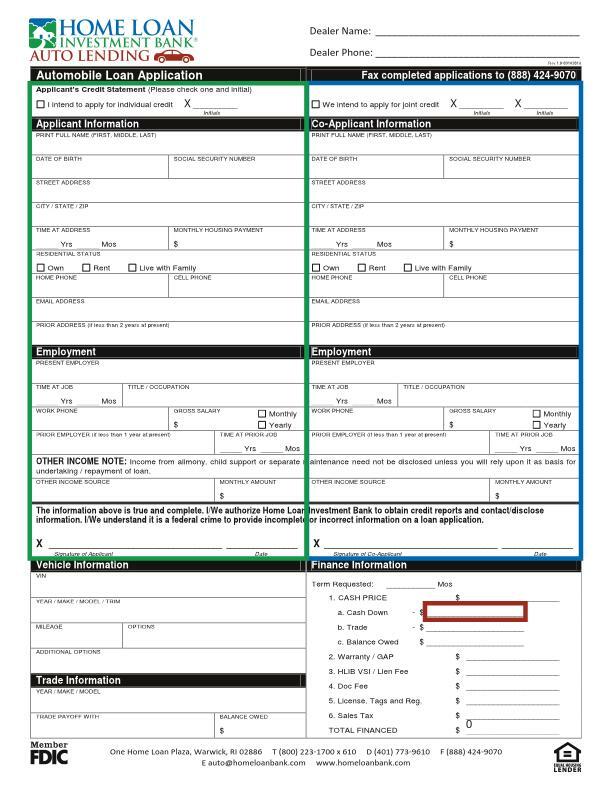 If applying with a co-signer also fill out the blue box. Complete the red box with your down payment (if you want the minimum down payment leave it blank). If you have a trade we need to physically inspect it first. Drop the application off with (preferred) us or fax it to us at 401-762-4556 (at your own risk, faxes are not completely secure) and let us know what vehicle it is for. We are usually able to get the decision, rate, term, and stipulations the following morning after submitting the application. What should I put down? If you want to put down the minimum, leave the down payment blank on the application and we will see if no down payment is acceptable or receive a reply with the minimum down. We recommend you put down as much as you feel comfortable putting down because this will save you money otherwise subject to interest. Who do we work with for financing? We work with Home Loan Bank in Warwick RI. We have a good relationship with their financing department and have set many customers up with loans from them. Being a local bank helps make the process easier. We generally hear back within 45 minutes and then give you a call. Let us know if you don't hear from us within this time frame and we will find out the status of your application. What's the next step after the application? Home loan bank will reply with the APR and several options for terms and monthly payments. They will also include the stipulation you may need for closing (license, pay stubs, etc). If there are any things preventing a deal from going through, there will be an explanation of the issues if you want to correct them. Generally the lowest credit score that gets accepted is a 620. There is some room in this figure if a cosigner has good credit. Additional, if you are a first time borrower with a credit score of 0 you can meet their requirement with a 640 cosigner. We encourage everyone to run a soft credit check before applying for any loan. I would recommend using Discover's credit check because it is secure and easy. The advantage of a soft credit check is it will give you insight to what type of financing you are eligible for but it also gives you the opportunity to identify misinformation that you can work on correcting. Do we offer subprime financing? We do not offer subprime financing with maxed out APR rates to the legal limits and large lending fees. You are free to independently get a loan from a credit union who depending on the vehicle may accept credit scores as low as 600. If you fall below this mark we would suggest saving up a little bit and doing a cash deal with a private party for a inexpensive reliable vehicle. In the meantime, try building your credit. Nerdwallet is a pretty good website to use a resource. The minimum loan amount is $3,000. Are there any additional costs to finance? Home Loan Investment Bank charges $125 for VSI (insurance that protects the lender if a borrower does not have required insurance coverage) and $199 for an administrative fee.